New Members for the Main Tank! We have had two young Ottos (aka Otocinclus affinis) in the Guppy Tank (see The Great Immigration Completed) since 23rd June, and after observing their behaviour and read up about them, we decided to bring in a few more for our Main Tank. Besides adding variety into the main tank, our primary objective is also to help control the alage growth. The Ottos are very good algae eaters, and they appear to be always hungry, especially for the young ones. They are also very peaceful loving and won’t harm the other fishes, unlike the Chinese Golden Algae Eaters we had previously. So I went down to our nearest fish shop at Vista Point, and was glad to hear that a new batch of Ottos had just arrived. Having a fresh batch should probably mean a healthier batch, I think. I then netted up four Ottos from the tank, and brought them home. The plastic bag containing them was washed under running water and then placed afloat on the main tank so they can get used to the water temperature in it. After around 30 minutes later, I cut open the plastic bag (too lazy to untie the rubber band) and poured its contents into a yellow container I had. From there, I then netted up each of them into the main tank, taking care not to let too much of the water into our tank, in case there are bacteria and toxic materials in it. Once they were released into the tank, they swam together in a shoal and settled on the left side of the tank, where our lotus-shaped plants were. They appeared to like the plant very much as they kept ‘vacuuming’ on the leaves. They would also rest there for extended periods of time. Three of them would always stay in a group, probably believing that they would be safer together. The other Otto, however, would often wander alone, exploring the thick vegetation in the center of the tank. Although that would ‘belong’ to Fiesty’s well-guarded terroritory, Fiesty would not attempt to chase him away, seemingly knowing that as he is an algae eater (aka herbivore), he is of no threat to his protected offsprings. How interesting! After some time later, when all the four Ottos have trusted upon the lack of predators in the tank, had started to explore the rest of the tank. At one point of time, all of them settled at the glass wall at the rear of the tank, where algae is spreading the fastest. They appeared to be sucking onto the glass wall eagerly, so it appeared that they were having a feast with the algae. That would be really great if they were indeed clearing up the unwanted algae for us! Some friendly folks have responded to my post on the Arofanatics forum, and one has suggested that our cory could be infected with Epistylus, a type of fungus infection which grows on corydoras with injured spine. Observations: Balls of fungus, usually located on dorsal and/or pectoral spines. Conditions: Epistylus grows on gravel and moves onto fish with injured spines. 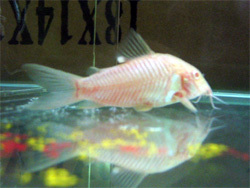 Fish Affected: Corydoras, Pimelodellas, any armored catfish, and iridescent sharks are especially prone, although it can occur in any fish with injured spines. Cure: A combination of malachite green and formaldehyde, plus the actual removal of fungus balls to speed recovery. I am not sure if Pimafix, a medication we have that is well known for curing fungus and bacterial infection, contains the suggested ingredients. Anyway I have applied some Pimafix last night into the hospital tank in hope of treating him. Just as I was busying myself preparing for the water change scheduled tomorrow and netting up new sightings of guppy and gourami fries, something caught my eyes that provided with more activities to pursue. One of our Albino Corydoras had a relatively large white spot at the back of his dorsal fin (read: top fin). This alarmed me and I know the first thing I need to do is to quarantine him. Cat and I took out our nets and started our capturing of the cory. It was a really tough job, as we spent countless minutes trying to net the stressed cory out. He moved very swiftly and ducked all around the tank. It was most difficult when he hid behind the bogwood and vegetation. After many attempts, we finally got him out of the tank and transferred him to the hospital tank, at the cost of disrupting the fishes in the Main Tank. He was of course very nervous when he arrived at the small hospital tank but soon he settled down at the bottom of the tank, resting his body but breathing heavily due to his excessive ‘exercise’ while being chased after. Currently I’m still looking for the best ways to treat him, though most likely we will adopt to the White Spot medication that we previously bought. Hope he will get well soon. Pretty has been acting strange over the past few days, bearing a huge stomach and hiding in one corner. Having seen through several guppy deliveries, I knew it was a sign that she will be giving birth soon (again) for the third time. Fei Fei had beaten her to delivery two days back, with around a dozen of her offsprings making it to the safe haven in the Guppy Tank. The rest was either non-existent or could have been eaten up by the other fishes. Pretty’s delivery started at around 7pm+ tonight, when I noticed a few fries hiding amidst the plants. It was easy to distinguish between the newborn fries and the existing Four Musketeers due to their difference in physical size. Meanwhile, Fiesty has been acting very aggressive tonight, chasing after any fish who comes close to his nest. Even the innocent-looking musketeers were not spare the chase. 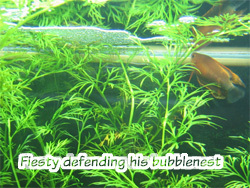 It has come to a point such that we start to think if he has been overdoing it when it comes to protecting his bubblenest; looks like Nemo has probably dropped some more eggs in it. After Pretty dropped the initial few fries, she appeared to have stopped dropping, but still staying in one corner near the surface. Only after a while that she started to swim towards a densely planted area in the central area, seemingly attempting to drop some more fries. However, before she can settled herself sitting on the plants in preparation of her delivery, the aggressive Fiesty immediately noticed her presence and dashed towards her, shocking her and chasing her away. This repeated several times until the point that it became unbearable to us, seeing that poor Pretty is being badly stressed whilst in the midst of delivery. I’ve read that stress in pregnant guppies could be fatal, so I decided to remove Fiesty temporarily until Pretty is done with her delivery. I netted Fiesty up, along with some floating plants into a yellow container, and placed it on top of the Main Tank. Fiesty looked a little angry for making him leave his nest, but stayed quite motionless in the small container. Back in the Main Tank, Pretty finally got some peace in her delivery, as she made her way to another planted region in the tank, dropping few more fries. Just as we thought she would be able to get through the entire process uninterrupted, Nemo seemed to have noticed the existence of new fries (aka food?) and swam straight at her, chasing after the newborn fries. This of course interrupted Pretty and she had no choice but to search for another safe spot. She then proceeded back to the central region, sat nicely on top of the plant, and tried to continue her delivery. It wasn’t easy at first, seeing that she was trying hard to push her fries out but with no avail. It was only after a while that she managed to drop a few more fries while she bent her body. While Pretty was at it, I decided to check out Fiesty’s condition in the yellow container, so I looked over the Main Tank into the container. Fiesty looked fine as he remained quietly in it. I would have expected him to swim around aggressively in anger. Just when I was about to turn my attention back to Pretty, something tiny caught my eye near the floating plants in the yellow container. Upon a much closer observation, I noticed it was a very tiny fry! I quickly called for Cat to come over to take a look and she was equally surprised! We were wondering what it was, whether it was a premature guppy fry, or a gourami fry. I have read previously that the gourami fries are very tiny, but I have never expected them to be SO tiny! It was basically 1/10th the size of a newborn guppy! Check out the photo we have taken below, with Fiesty included in the picture to illustrate the size of his fry. Click on the photo for the enlarged version. Fiesty appeared to have noticed his fry in the container too, but did not attempt to eat it. Only till then did we realise that the reason why Fiesty was behaving so aggressively was to protect his small little fries. We have wronged him on his behaviour, though his defensiveness was a bit too much still. Meanwhile, I have set up a small tank, originally housing the smaller batch of guppy fries before they were shifted to the Guppy Tank. Using a scoop, I took some water from the Main Tank to be placed into the small tank, only to realise that a Gourami fry was scooped up too! They were so small that they could easily be missed! I then fished out the other gourami fry from the yellow container and joined him with his sibling in the small tank. I then peered over the surface of the Main Tank, and managed to notice another two gourami fry near the surface! I quickly scooped them up and placed them in the small tank too. So in all, we have four gourami fries in isolation now. We tried to look for more gourami fries in the Main Tank but could not find any more; probably they were safe with their father at the bubblenest. We decided not to disturb Fiesty and let his fatherly instincts take over. 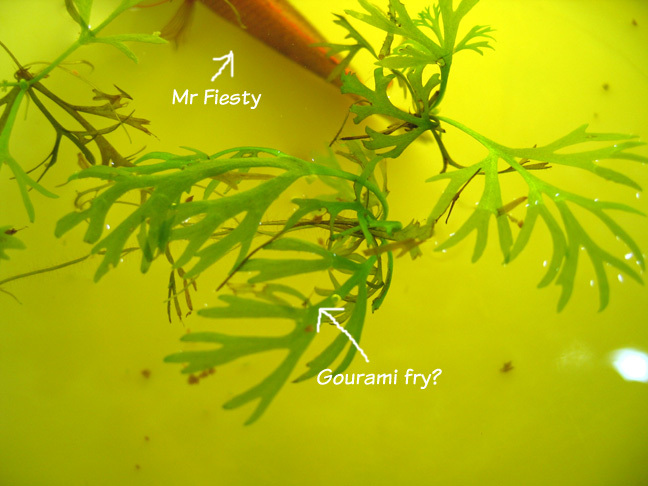 Meanwhile, we will continue to observe the four gourami fries and hope that they will grow well. It is quite understandable why they are so small in size compared to the guppy fries, since the latter is a livebearer, and has lived in their mum’s body before coming to this world. On the other hand, the gourami fries were hatched from the eggs after a mere two days after Nemo dropped them. As for the Guppy Tank, the fries are looking fine, though I have noticed a small number of them having some deformations, such as unusual body shapes such as a deformed head, or a bloated stomach. Despite their disabilities, they will continue to be protected from the harsh environment in the Main Tank and given the opportunities to grow up healthily. Hope they will turn out fine as they grow older. Back to Pretty, she has finished giving birth and is hungrily searching for food to ease her appetite. She sure looks a lot slimmer after her delivery! 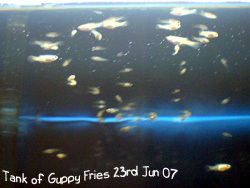 Our fourth batch of guppy fries came into this world yesterday, in a most silent and unnoticed way. Cat and I arrived home late after a movie, and after having sat in front of the Main Tank for some time, I was surprised to catch sight of several small, black guppy fries swimming timidly at the rear of the tank, just beside the plantations. Most of them were staying close to each other as a group, banking on their instincts to survive in a seemingly alient environment populated by gigantic (i.e. relative to them) fishes. Judging from their physical appearances (i.e. colour), we immediately knew they were the offsprings of Fei Fei, who belongs to the Cobra skin genes. Fei Fei has also indeed slimmed down quite a bit after her delivery. Both Fei Fei and Pretty have been behaving strangely with huge bellies, so on the other hand, this did not come as a complete surprise. As for the other fishes, having lived together with the guppy fries of Pretty, seemed to grow oblivious to the addition of these fresh fries (aka food in their eyes?). Still, we wouldn’t know if some of the poor souls have already been devoured by the fishes, since we only found a total of 18 fries by the time we spotted them. Fiesty, the largest fish in the tank, seemed to be uninterested in them as he continued his continuous effort in building up his bubblenest. I have intended to leave them in the Main Tank, since there does not seem to have any immediate danger, given that the previous batch of fries (5 minus 1) has managed to grow up peacefully. However, Cat pointed out that with the other fishes fighting for food, these newly born fries might not be able to get adequate nutrients in the Main Tank. Therefore, we decided to move them over to the Guppy Tank, where the rest of their silbings and friends are. Till now, I have only succssfully moved 17 of these fries over, since the last fry has been acting very tactical, making good use of the plants to avoid my ‘capture’. Not wanting to create too big a mess in the Main Tank, I will try again tonight to migrate the last remaining hero. Also, because of the addition of these tiny fries, I had to wrap a wool-like sponge around the inlet of the filter, as the holes of the filter might be large enough to swallow up the poor, unsuspecting newly born fries. I will remove the sponge after they have grown up to a larger size. Meanwhile, everything is looking great in the Guppy Tank; they will swim in a orchestric manner, responding to any movements outside the tank. I felt like a conductor sometimes, where a wave of my hands will create in a picturesque scene of the guppy fries swimming in the same directions. From far, they look like stars in the sky, with the blue wallpaper as the backdrop, and the bright florescene lights shining down upon them. It is really one beautiful sight, and it is always an enjoyable sight to watch after a long day’s work. With the introduction of the new cliff-like bogwood on the right side of the Main Tank, Garra has been enjoying the shade of his new hideout, a small opening somewhere near the middle of this new bogwood. There is a small arch at the bottom of the bogwood, thus creating a space between the gravel and the bogwood, creating a natural looking cave where Garra would fit in perfectly (although actually that amount of space can still accomodate one or two more fishes of his size). His previous favourite hideout was below the bridge ornament, and now it would have been replaced with this. 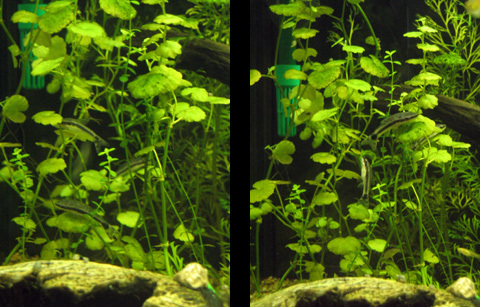 Previously, when we had our tree log ornament before the unfortunate incident (see Tree Log containing hidden dangers…), the two Garra Flavatras would fight for the ‘cave’ opening too, and even chase other fishes away when they got too close to their hideouts. So it appeared that Garra Flavatras do enjoy some kind of isolation in dark and secluded caves. It is actually very fun to see Garra popping his head out from this new cave now, checking out the passing fishes and protecting his terroritory. Occassionally still, he would come out from his hiding and duck under the bridge, probably for some mild sun tanning? Meanwhile, Xiao Bao the smaller Leopard Corydoras, is still isolating himself most of the times, and barely eating much (though I do see him digging the gravel for food occassionally or late at nights). Interestingly, Da Bao, who is nearly twice his physical size, has been taking good care of him, nudging him softly now and then to keep him active, and would follow Xiao Bao around, probably to encourage him to keep moving his body to stay healthy and fit. 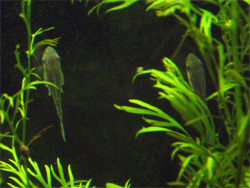 Corydoras, being a species who enjoys company with their own kinds, is indeed an interesting fish to keep. I’ve also read that they could live for many years under good aquarium conditions. That’s why there are quite a number of aquarium hobbyists who enjoy keeping corydoras as their main fishes. Golden Killers? ), we decided to remove them as soon as possible, before they do harm to our guppy fries, and also to minimise any emotional attachment to them (we have even named them). On my way back from my brother’s house, I passed by the fish shop at Vista Point, and having done a bit of research on a suitable replacement, I bought two Ottos (source) and was surprised how small in size they were when I first saw them. Basically, they were even of about the same length of our largest guppy fry. Well, that can’t be a bad thing anyway, and it would be fun to see all the fishes grow up everyday. They appeared frightened when they made it to our Guppy Tank, but after a while, they settled down and seemed to love the bridge ornaments. They would just keep sucking (algae?) on every parts of the bridge. As they are small in size and their colours blend well with the colours of the bridge, it could be hard to locate them at times. They would also hang out at the castle ornament quite often. This morning, we decided to transfer all our guppy fries in the two fry tanks into this Guppy Tank, since I felt the water has proven to be suitably ready for them. It was a quick process, as I netted all the fries from the two tanks and brought them into their new homes. Surprisingly, they were highly adaptive and soon went back to their daily routine lives, such as nipping the ornaments and stones for food. Though most of the fries would still stay near the surface, it is encouraging to see many of them have taken the courage and effort to explore every parts of the tank, thus balancing out the tank. The fries would occassionally nibble a little on the unsuspecting Ottos too. It’s good to have finally seen them through The Great Immigration, and hope they will live well with their large family. As for the Main Tank, I placed a new piece of bogwood into it during the water change last night. The bogwood was initially planned for the Guppy Tank, but seeing that it was taking up quite a substantial amount of space and does not go well with the other ornaments, we decided to use it for the Main Tank instead. I liked the new outlook of the Main Tank with the additional of this bogwood, the scenery curves in towards the front on the right side of the tank, making it look like a cliff-side scene.